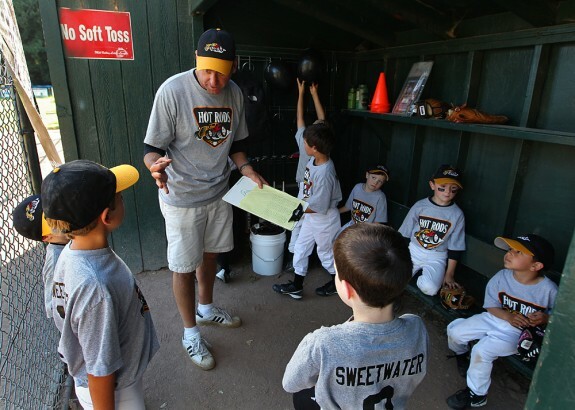 Thank you Mill Valley Little Leaguers! Last week I had an amazing opportunity to shoot pictures of baseball players giving it their all as they played an intense game of ball under glorious late-afternoon sunshine in the beautiful San Francisco Bay Area. Was I shooting the San Francisco Giants at AT&T Park? Nope. Was I shooting the Oakland A’s at the Oakland Coliseum? Nope. 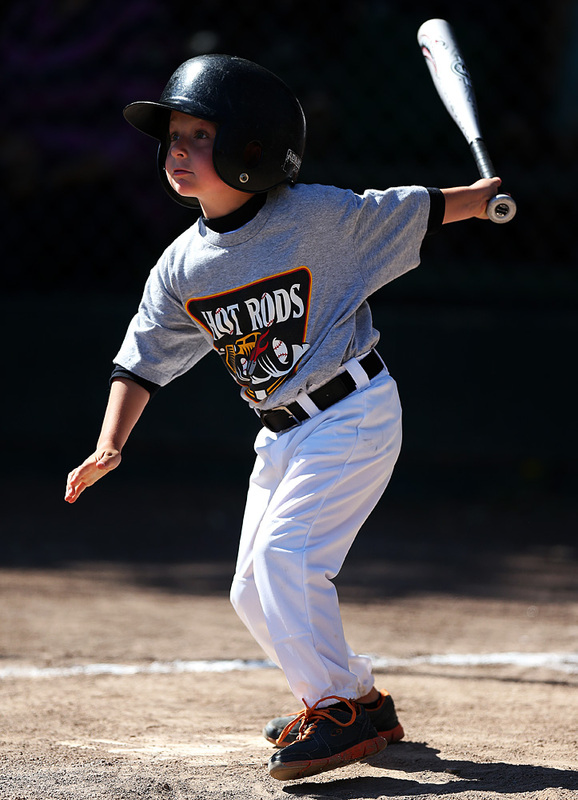 I was shooting the Mill Valley Little League Hot Rods, managed by my good friend and NEVER. SAY. DIE. book partner Brian Murphy, in action against the dreaded Mud Hens at Boyle Park in Mill Valley, California. I have not been to a Little League game in a long time. 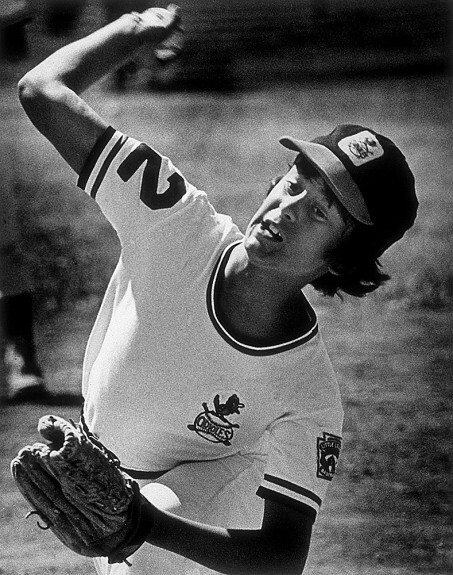 Things have changed a little bit since I laced’ em up for the Centerville American Little League Orioles in Fremont, California back in 1976 (see above). When I was a kid we did not start playing till we were 8-years-old in the second grade. 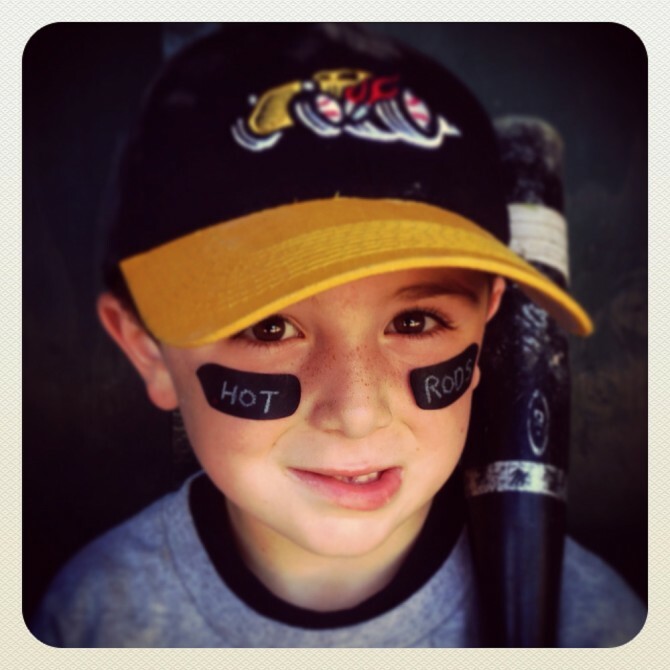 The Hot Rods are all 5 and 6 years old and started the season hitting off a tee before they began hitting against live pitching from one of their coaches a few weeks ago. This is the first year that Murphy has been coaching his son Declan’s team, so I thought it would be fun to drive up to Mill Valley to watch Declan play and take some pictures of the other young men on the team. I brought all my regular gear that I bring to shoot the big leaguers with and was looking forward to shooting on this old school diamond that Murph had played on when he was a youngster. There is nothing like shooting a game in the late afternoon light, and the Hot Rods vs. Mud Hens 4pm first pitch was right up my alley. I talk to photojournalism students and young photographers all the time who want to shoot big-time pro sports. 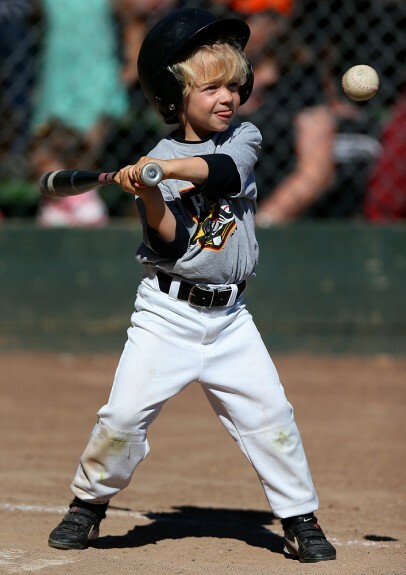 I ask them why and they always say, “…because I want to have pro sports in my portfolio.” I generally respond that they don’t need pro sports- they just need great pictures, and great pictures can be made at Little League and high school games. It was my chance to prove my theory correct! I got to the park a little early to get the feel of the old diamond and the Hot Rods. I decided to shoot the first inning (they would only play three) from outside third base with my 400mm lens. By shooting the batters from third base the background would go black with the players popping out in the pretty late-afternoon light. I was having too much fun as the Hot Rods hit all the way through their batting order (this happens every inning at this age). I knew I had some great stuff, and I knew the parents were going to love the pictures I was getting (see above). 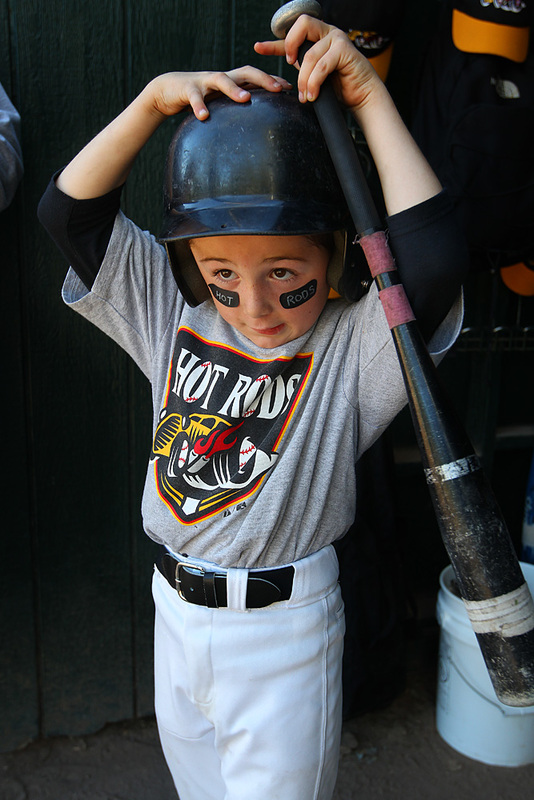 In the second inning I went outside first base so I could shoot the Hot Rods swinging the bat from the front-lit side and get their facial expressions lit by the warm sun as they tried to connect with the ball. By the time the second inning ended I knew I had enough good batting pictures so for the third inning I thought I might try shooting some features in the dugout. I love shooting Major League players getting ready in the dugout before games. It is a great chance to make some nice feature pictures that show off the players personalities a little bit before the serious games begin. 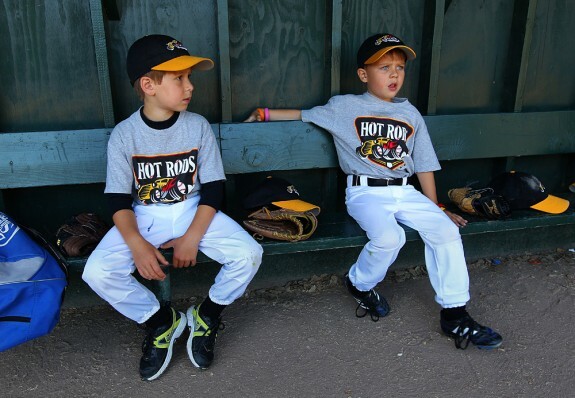 Luckily the Hot Rods dugout was one of the best I have ever seen and was as good as a Hollywood movie set for me. The old diamond at Boyle park has awesome dark green wooden dugouts that allowed me to shoot nice pictures of the Hot Rods in open shade so I could see their faces and try to capture their joy from playing the best game in the world (see above and below). By the time the game was over and the young ballplayers ran over to their parents to hit the post-game spread I was so excited about what I had shot. I could not wait to get back home to download my cards and edit my take. 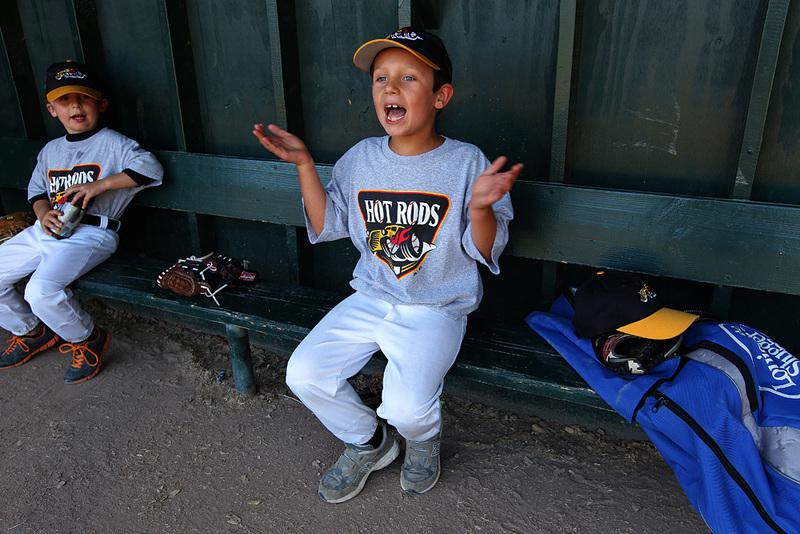 I ended up putting together several hundred images into an online gallery in my PhotoShelter archive, allowing the parents to download the files of their boys to get prints made, etc. 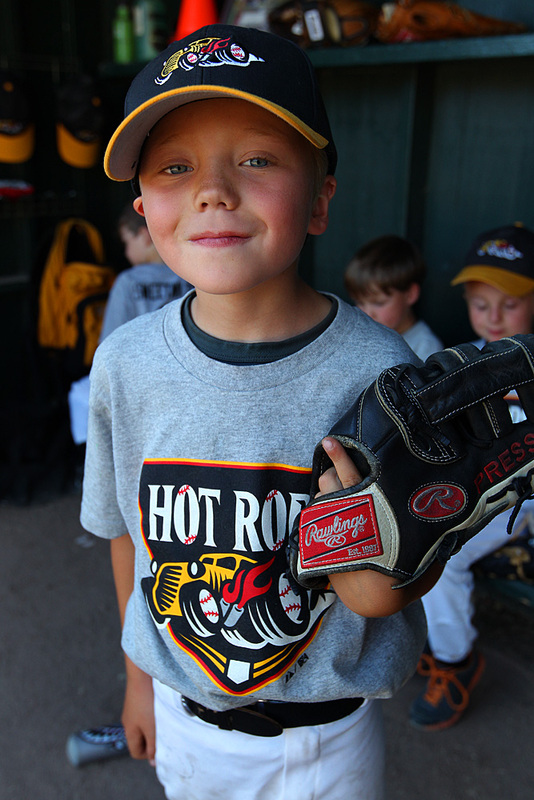 I would like to thank all the ballplayers on the Hot Rods and their parents for allowing me to photograph their game last week. I had an amazing time and really enjoyed shooting the game. How could I miss shooting these kids in such a gorgeous setting? Good luck to the ballclub during the rest of the season! These pictures are so great … right down to the one of YOU as an 11 year old, complete with photo credit. You are all class, and all talent! Thank you so much for spending time with us & recording that beautiful day for posterity! We are so excited to find him in photos in this posting, & can’t wait to show them to his grandparents!